Injury or arthritis in the knee can result in impressive, chronic pain and have a significantly negative impact on quality of life. Individuals with knee pain may have difficulty with all levels of physical activity – walking, running, climbing stairs, and even the simplest activities such as sitting or standing up. More strenuous activities such as tennis, basketball, or hiking may be completely out of the question. Living with chronic knee pain and injury that limits quality of life is not necessary. Unfortunately, many put off resolving their knee issues, which can exacerbate injury, increase pain, and further limit activity. Steven W. Meier, M.D., has been working with individuals for 17 years to resolve chronic knee pain and injury. Dr. Meier addresses each case with a unique, holistic approach, as every case will have unique differences along with contributing factors from lifestyle, work, and history. Dr. Meier uses a multimodal treatment approach tailored to each unique case. This may include regenerative injection therapy, minimally invasive reparative procedures, or surgery. For those who are candidates for a partial or total knee replacement surgery, Dr. Meier is one of a select few surgeons who is certified to use the Mako robotic-arm assisted technology to perform partial or total knee replacement surgery. This cutting edge technology offers unprecedented precision in accuracy/position of the implants. This accuracy results in a longer life of the implant, and reduces the chances to need a revision surgery in the future. Knee replacement surgery helps hundreds of thousands of people each year to get their active life back. Since knee replacement surgery was initially performed in 1968, total knee replacements have become one of the most successful procedures in all of medicine. In fact, more than 600,000 knee replacements are performed each year in the United States, and that number is expected to increase 673% in the next 20 years. Whether you are just beginning to explore your options or have already decided upon knee replacement surgery, Dr. Meier, Super Doctor for thirteen consecutive years and trusted Beverly Hills surgeon and his team can provide excellent guidance and treatment expertise. 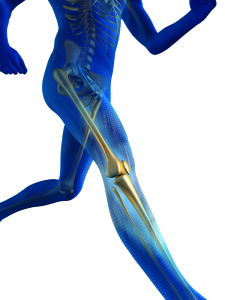 Call Meier Orthopedic Sports and Regenerative Medicine today at 310.736.2793. The knee joint is composed of three bones: the lower end of the femur (thighbone), the upper end of the tibia (shinbone), and the patella (kneecap). Several large knee ligaments (ACL, MCL, PCL, and LCL) hold the long bones together, providing stability to the joint. A smooth tissue substance known as articular cartilage is located between and around the area where the bones touch to protect them and enable them to move easily. Meniscal cartilage is attached to the flat plateau of the tibia (shinbone) and acts as a shock absorber to help cushion the entire joint. The remaining surface of the joint is covered by the articular cartilage at the end of the femur, and the entire joint is all enclosed by the synovial membrane, which is a thin lining that releases a fluid that lubricates the cartilage of the joint. Thanks to this delicate balance, a healthy knee has a full range of motion without friction (and therefore pain). However, disease, injury, or inflammation all can disrupt this biological harmony and can result in pain, muscle weakness, and/or reduced function. Osteoarthritis is caused by age-related wear and tear of the knee cartilage. After the cartilage is worn down enough, bones are able to rub against each other, causing knee pain, stiffness, and inflammation. Osteoarthritis usually occurs only in people over the age of 50, though it may sometimes occur in people much younger too. Rheumatoid arthritis is a disease of the immune system that leads to chronic inflammation and abnormal thickening of the synovial membrane that surrounds the knee joint. It can cause cartilage damage and eventually cartilage loss, as well as pain and stiffness in the knee. Post-traumatic arthritis occurs after a serious knee injury. Bone fractures to the tibia, femur, or patella, as well as the trauma that results in ligament tears of the knee can damage the articular cartilage. Once the articular cartilage is damaged, it is more prone to wearing away and further damage. This can lead many times to chronic knee pain and limited knee function. Arthroplasty is the reforming of a musculoskeletal joint and is commonly referred to as “joint replacement.” A knee joint replacement procedure can be performed by resurfacing part of the knee (partial knee replacement), or by resurfacing all components of the knee (total knee replacement). Preparing the bones: Dr. Meier removes the damaged cartilage surfaces at the ends of the thighbone and shinbone, as well as a small portion of underlying bone. Metal implants are positioned: Metal components take the position of the removed cartilage to recreate the joint surface. Kneecap is resurfaced: If the patella is involved and needs resurfacing, Dr. Meier will cut the undersurface of the kneecap (patella), and install a new plastic surface to interact with the front of the femur. Insert a spacer: In between the metal components, a medical-grade plastic is inserted. This will create a smooth gliding surface. Patients are usually put under general anesthesia (asleep) during knee arthroplasty. The procedure typically takes about two hours. 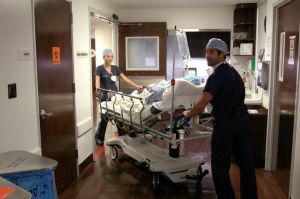 For total knee replacements, patients will recover in a hospital for a few days so that they can be properly monitored with regard to pain management, and blood clot prevention, among other things. Patients will also begin physical therapy while in the hospital. medlineplus.gov has more information about knee replacement procedures. A partial knee replacement, also called a unicompartmental arthroplasty, is an option that Dr. Meier may recommend for some patients with chronic pain who are considering a knee replacement. Most patients with severe arthritis have significant wear in two of the three joint compartments, but a minority of patients have wear confined primarily to one joint compartment and might be candidates for a partial knee replacement. Schedule a consultation with Dr. Meier to find out if you may be a candidate for a partial knee replacement. In the immediate weeks after partial or total knee replacement surgery, a fall could be devastating and precipitate the need for another knee operation. You will want to avoid that by using any or all of the following: cane, crutches, a walker, hand rails, or someone to help you ambulate until you regain your balance, flexibility, and strength. A vigorous physical therapy rehabilitation program will be set up by Dr. Meier and/or a physical therapist. Recovery time will depend on a number of variables, but usual time to full recovery can be as little as three months. Some people might take longer to recover, and they could take up to six months to regain full muscle strength and mobility, and feel really comfortable with their joint again. About 90 percent of modern knee replacements will still function well 15 years after surgery. The important thing to remember is to follow instructions after surgery. If you take care of and protect your knee replacement and maintain your general health, you will greatly contribute to the success of your surgery. Dr. Meier is one of the world’s foremost experts in knee surgery. He has the experience and knowledge to perform your knee replacement surgery successfully. Find out more by contacting his Beverly Hills orthopedic practice at 310.736.2793. You may also fill out our contact form and a representative from Meier Orthopedic Sports and Regenerative Medicine will be in touch with you shortly. Next, find out about torn meniscus treatments.